Apple Watch is the sort of science-fiction gadget that people used to dream about as kids. What kinds of apps do you envision for this new device? 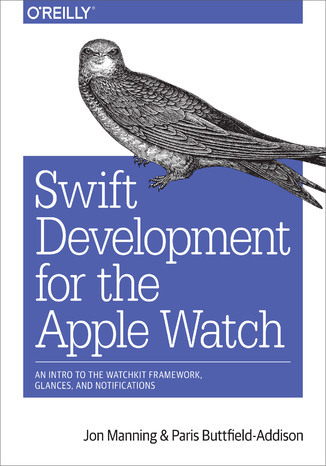 If you...re comfortable using OS X, Xcode, and iOS-and familiar with Swift-this concise book shows you the basics of building your own apps for this wrist-mounted computer with Apple...s WatchKit framework.You...ll learn what an Apple W atch is, what it isn...t, and how and why people might interact with apps you build for it. This practical guide also examines the type of apps most suitable for this device, and shows you how to be a good citizen in the iOS/Watch ecosystem.Learn the Watch app lifecycle, and understand how these apps interact with the user...s iPhoneBuild a Watch app and its iOS counterpart by adding controls, working with multiple screens, and sharing dataDesign a simple glance, the non-interactive Watch component that provides quick-look informationAdd functionality to the notification system, including actionable items, and display them on the Watch faceDesign and build complications, Watch-face gadgets that can display quick snapshots of information, including future events with Time Travel Ebook porusza temat Development. Jedną z istotnych spraw poruszanych w ebooki jest: WatchKit. Jeśli interesuje Cię: Framework, to ebook dla Ciebie. Dużo wiedzy na temat: Glances w formacie EPUB, MOBI i PDF. Hasło przewodnie tego ebooka to Notifications. ISBN 978-1-4919-2528-7. Porównywarka cen ebooków, które dostępne są w formatach PDF, MOBI i innych. Na urządzenia Kindle i inne. Tutaj znajdziesz ebook, którego szukasz. Nie wszystkie ebooki w ofercie są darmowe. Wspierajmy autorów i kupujmy ebooki.